Enormous waves are sweeping in over Earth and through your bodies and minds. Those of you who still are battling not to loose control in this transition are having a hard time and I encourage you with love to let go as you will receive so much good from this shift when you stop battling and deliver yourself to your soul, who knows exactly what is going on. You who have capitulated have noticed great changes in your mind. You feel that you are moving from insecurity to security within your many areas in your life. What has been a large dilemma for you is the fact that you have found it hard to accept your enormous power. You have found it hard to accept that you are enormous beings of light that have chosen to incarnate in this life time in order to put things right and you have had a hard time to accept that the time has arrived. However, with the new waves of light you find the power to take charge of your own power and thus your own lives. In the old days it has been very difficult for you to see the light in yourselves. Most of you have been very good at seeing the light in others. Maybe you have even seen more light in others than what they have managed to live up to in this life. Many of you have experienced unhappy love and unhappy relationships where you have entered with great expectations and joy for a joint life in love, but where the relationship has ended in powerful aggressions and much sorrow as your compassionate heart over estimated the other person’s ability to be loving in this life. It has been very difficult for many of you Lightworkers to see the true ability among humans in this incarnation. You have made enormous sacrifices for others as you in your heart have felt it as your mission to give others what they deserve in order to live in their own light. As many of you have not been sufficiently grounded in order to be able to create their own life on Earth from the existing conditions, many of you have battled to help others who have not at all had in their soul’s plan to be compassionate and loving humans in this incarnation, instead of helping yourselves to create a loving life. When you now have entered the shift into the New Era you have grounded yourselves and with this you have now the ability to take back your power and see the truth on Earth. You can finally start a life for yourselves and it will make you very happy. To help other will continue to be part of your continued life, but the help you will give from now on will look different. You will do that which is for your own highest best. You will create a life from YOUR JOY. This will in turn result in you helping others to start take responsibility for themselves and open the gifts they have brought with them here to develop. You will remember that all people are here on Earth in order to find their own way back to their own light and you will remember that all humans have with them their own toolbox in order to succeed. You are such beautiful beings and you have worked so hard. I ask you now to capitulate from all old notions about yourselves and let go of all the old perception frames that have been creating the illusion in the old days. Give yourselves appreciation for what you have managed to create and experience during the old times. Connect yourself to your soul when you meditate and ask it to show you what has been its purpose with your incarnated life in the old times. You will then see and understand how fine everything has been arranged by your soul and all other parts of yourself. You have achieved exactly that which your soul had set out to achieve and you have followed your plan perfectly. When you now make it clear to yourselves how well you have created your old life and how you together with all your part personalities have achieved to experience exactly what your soul set out to achieve you will feel a strong trust to yourself and your future life. You will be able to relax and turn yourselves over in a completely new way to your soul in the New Times. 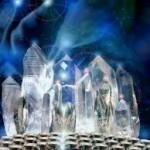 The powerful energies that will sweep in beginning of next year will put things right. It is as an invisible force that will rearrange some parts of your life, without you have a say in the matter, where you are on your level of consciousness. You will first feel confused, but will then understand the bigger picture later on in the coming year. In order to sure that everything will happen correctly we in the higher spheres will have complete overview of what is happening on your Earth. We support you with our light where we are most needed and none of you will be left unattended. The force in you will change rapidly. You will have access to more energy and during next year many of you will start to heal from the physical and mental pains you have experienced during several years. I very much look forward to following you in your development in the shift to The New Era. I am here for all of you if you wish to receive help from the Crystal Kingdom. Reach out with your hand towards us in the higher spheres, towards your angels and guides. We are all here to help you realize yourselves and take back the power and full potential. 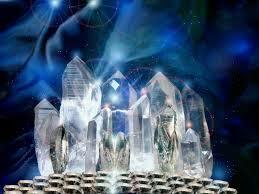 With large loving energy hugs I send you all my crystalline love and give my thanks.